Network monitoring, automation, security & access - without using the network. 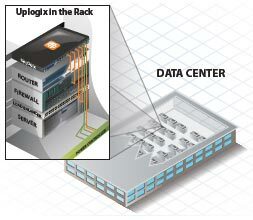 In addition to the solutions that local management brings to network infrastructure devices, Uplogix has a number of features for management automation of servers. The benefits are reduced operational costs, faster resolution when issues arise and improved security and compliance vs. centralized-only management. Secure Access | Provides secure access to remote devices with web-only management interfaces or no console port without requiring additional overhead to manage, leaving no need to consume an additional switch port, maintain VLANs or manage user access for more devices. Uplogix also integrates with TACACS+ and RADIUS for remote authentication. Service Processor Automation Using IPMI | Provides users with the ability to manage, diagnose and recover servers, even if the OS has hung or the server is powered down. KVM over Service Processor | Allows IT administrators to gain local access and control to a remote server (i.e. provisioning, monitoring, troubleshooting, restricting access) via a local desktop without having to deploy external KVM appliances, functioning independently of the server’s operating system or primary network connection utilizing an automated out-of-band connection. Detection, notification, prioritization and remediation can take over an hour for even small server issues like a full temp file. In this example, traditional NMS detects a previously unknown problem within 10-15 minutes of the event. Over the next few minutes trouble tickets are opened and Ops is notified of the problem. The problem is identified, but the system administrator response depends on priorities. The admin isolates and resolves the problem over the next 30 minutes or so by logging into the affected system, cleaning up files, and finally closing out the trouble ticket. Even a basic server issue could last over an hour and require a trained professional. With Uplogix, the full temp file is detected within 30 seconds with local monitoring and is verified over a few more polling periods. Uplogix is then able to perform cleanup actions (like removing old files, running scripts, etc.) and verify that the problem is solved. Finally the alarm is automatically cleared through the NMS. If the problem is not solved, Uplogix can notify the NMS and forward specific server status information. In Part 2 of this series we'll address the functionality available for server management over Ethernet and Serial connections. Cloud Computing: The Destroyer of IT? Cisco's Chambers on "good enough networking"
What exactly is FIPS 140-2 compliance? Looking to buy a console server?